When you visit the Merlet website link here on the sidebar, you will see the familiar names of popular Merlet models like the Prelude, Pulsion, Kaliste and Empriente. What you won’t find are the newest models recently added to the Merlet collection. Why? Because this company has an American market and a French market that apparently keeps their product lines separated. 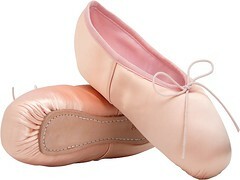 Merlet has introduced the new N2 model as a half-shank pointe shoe for advanced dancers. This is a contemporary shoe design made with high-tech performance in mind. Of course, the name N2 is another example of those futuristic-sounding names that boggle the mind and somehow “kill the romance” of feminine shoe names. Oh well. You can read more about the N2 on this U.K. dance supply company website, Dancia; one of the few places that offers details in English. The new Adagio by Merlet has a pretty name and an equally lovely aesthetic. 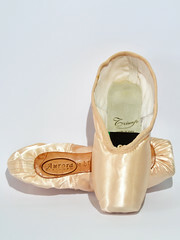 The Adagio is described as a traditionally-made pointe shoe that has a medium strength shank appropriate for advanced dancers. You can also find this shoe on the Dancia U.K. website mentioned above. In discovering these new Merlet models that originate from France, I also found two more that may or may not be established models by Merlet of France; the Elista and the Mira. For starters, I have to say that the name Elista and the name Kaliste are very similar-sounding to each other (in my ears). 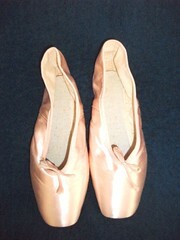 Both of these shoes are salmon-colored canvas pointe shoes with the mid-foot-to-heel section made of stretch materials. They look the same to me when compared side by side. This really deflated my excitement balloon and makes me question why manufacturers give different names to the same shoe; a real peeve for pointe shoe detectives! What About The Merlet Mira? The Mira model was an accidental discovery for me. 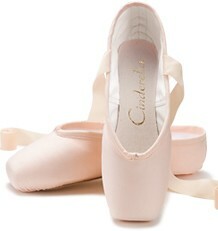 From what I can translate from French to English, the Mira is a traditional model recommended for advanced dancers. It comes with three choices of shank strengths and the shanks can be ordered three ways; full-shank, 3/4 shank or 1/2 shank. 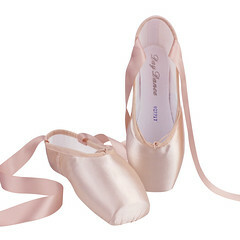 The video below shows the beauty and form of the Mira pointe shoe. The Mira from Eric Johnston on Vimeo. What I love about Facebook is being able to keep updated on any new products a pointe shoe manufacturer introduces to the market. You can see more photos and descriptions ( in French) of what this company is up to on their Facebook page; MERLET On Facebook. The Merlet Company has a brand new website under construction that will hopefully consolidate all of their French-based pointe shoe models onto one site. For now, dancers have to go through suppliers in Europe. Hopefully, the site will be up soon. Visit the new web address here at Merlet Dance. This entry was posted in French Brands, New Models 2012 and tagged Merlet Adagio pointe shoes, Merlet Elista canvas pointe shoes, Merlet Mira, Merlet N2 pointe shoes, pointe shoes from Merlet of France, pointe shoes with 1/2 shanks, professional 1/2 shank pointe shoes. Bookmark the permalink. All these models look gorgeous. I’d love to see what the N2 is like, especially considering it’s a half-shank. Merlet polycarbonate shanks can be super-hard; at least the shanks in their Performance model are, so it might not be what I need. 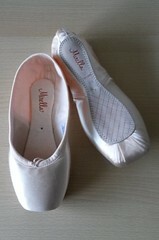 The video for the Mira is wonderful–I wish all pointe shoe makers did this for their pointe shoes. What a great way to see the shoe. Glad they have a new website coming–I wish they were more available in the U.S.! P.S. 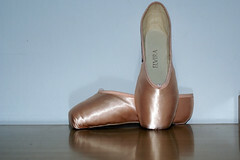 Have you ever heard of “Kersha” brand pointe shoes? Never saw these before and wondered if you’ve seen them before. It looks like a typo on the Cecilia Kerche CK 31 Clara model.